Map & GPS using skills. During the training ,the trainee did practical Map reading and theoretical first aid classes by Dr. Pele ,medical representative from France. Instructors and participants completed practical first aid training such as victim mobilization, fixing and using KET and Garda, use Portable Hyperbaric Chamber and bottled Oxygen. Similarly trainee went to DKD ice pulley system using Franco Garda and Yubra Glacier for C-Pully, Z-Pully 2 and 3 respectively and went to Yala base camp for snow craft activities such as Avalanche search using probe and Beacon(DVA) pratice. We know that our country is well known for beautiful Himalayas as well as one of the best holiday and adventure destination in the world. Many adventure activities had been taken place since the country opened for foreign holidaymakers and other adventure activities, which is the positive aspect in tourism industry. Naturally when there are more people involved in different outdoors activities including mountaineering expeditions the chances of the accidents during the adventure activities is also increased. As we know that there had been several accidents in different part of the country each year, which carries out the negative message for the tourism industry of Nepal. 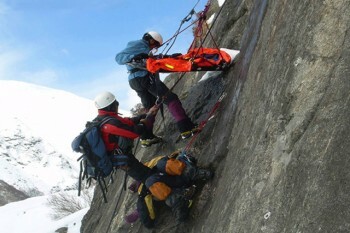 In order to prevent and minimize the risk in different incidents during above activities, the only option to prevent and minimize the risk in above mention activities is by providing enough appropriate High Mountain Rescue training.